Hampton Court Palace today opened its gates to some of the world’s rarest and most incredible cars as Concours of Elegance 2018 got underway. Running for the remainder of the weekend, this year’s Concours will see nearly 1000 of the most incredible cars ever produced gather in one of the UK’s most spectacular settings. 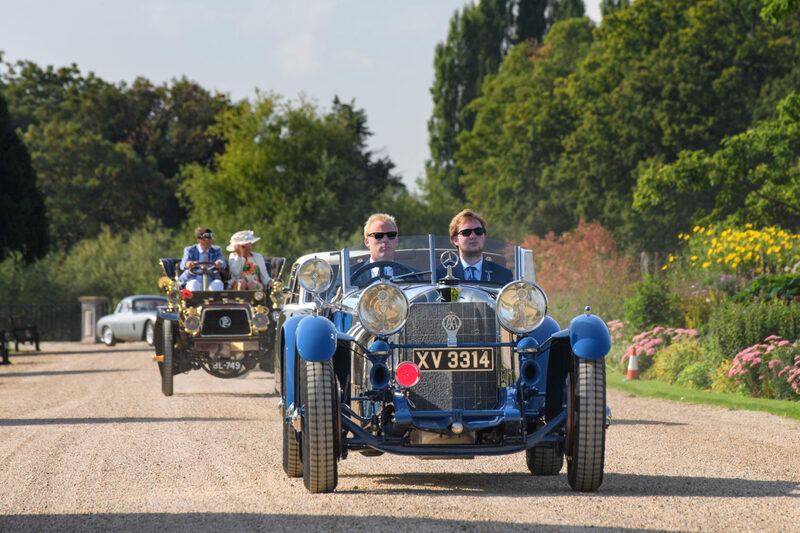 This morning saw the arrival of the main Concours of Elegance display, as they completed the final leg of their journey through Home Park and into the Palace – led by His Royal Highness Prince Michael of Kent. It was a unique opportunity for visitors to see unique coachbuilt Ferraris, race-winning endurance motorsport legends and pioneering vintage motor cars make their way into the glorious Fountain Gardens. Among these cars was the unique Mercedes-Benz S-Type Barker Tourer ‘Boat Tail’. Originally owned by racing enthusiast and British Racing Drivers’ Club co-founder Earl Howe, the car was fitted with a revolutionary body which incorporated a lightweight and aerodynamic shell with unique aluminium side pods and came fitted with an altimeter, all based on aircraft construction by legendary English coachbuilders Barker. Making its debut at the Concours of Elegance was a freshly restored McLaren F1 GTR Longtail, finished in iconic Davidoff Gulf colours. One of the most incredible endurance racing cars of its day, this F1 GTR was lovingly restored by McLaren Special Operations. Friday at the Palace also saw the debut of three new special features for 2018. The Aston Martin DB4 Celebration is a world-first gathering of cars – assembled by the Aston Martin Owners Club – which includes a DB4 prototype, an example of DB4 Series 1, 2, 3, 4 and 5 plus an original DB4 GT, DB4 GT Zagato and DB4 Bertone Jet. The newly launched DB4 GT Continuation will also form part of the display. The Future Classics feature is an all-new line-up of the Concours stars of the future, crowned by the completely bespoke and unique Rolls-Royce Sweptail. It’s the first fully in-house designed and fully coachbuilt Rolls-Royce in half a century, complete with a bespoke body and interior. The Sweptail is joined by the one-of-26 Aston Martin Vanquish Zagato Speedster, McLaren Senna chassis number one and the one-of-seven Aston Martin V12 Vantage V600. This year’s new ‘Harry’s Garage’ display – curated by founder of the Harry’s Garage YouTube channel and evo magazine, Harry Metcalfe – was a collection of the fastest supersaloons ever created. Among them you’ll find the 200mph Jaguar XE SV Project 8, the 205mph Aston Martin Rapide AMR, as well as past masters like the Lotus Carlton and the Mercedes AMG Hammer – the first saloon car to ever hit 186mph. Across the weekend, visitors will be treated to a number of car displays and trophy presentations, the first of which was the Club Trophy. The winning car, an Alvis Speed 25 Drophead Coupe by Charlesworth/ Hooper, is acknowledged as possibly the finest of Alvis pre-war models, complete with a Hooper body and a unique interior and fittings. The Alvis will now be displayed among the Main Concours cars at Concours of Elegance 2019. Jaguar will be hosting a special display on Saturday, Bentley will gather a number of historic cars on Sunday and Concours of Elegance media partners, Octane, will welcome the Octane Tour to Hampton Court Palace on Sunday, ensuring an ever-changing collection of vehicles.